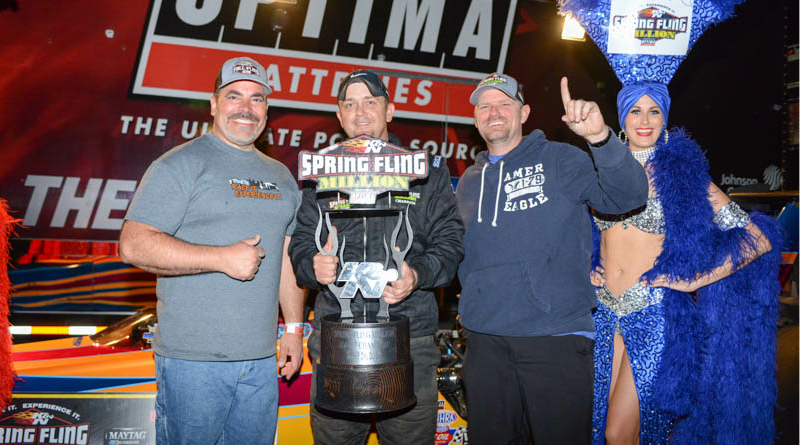 This week another person will join the illustrious group of Jeff Verdi, Luke Bogacki and Randell Reid as a winner of the K&N Spring Fling Million presented by Optima Batteries and held at The Strip At Las Vegas Motor Speedway. The event begins on Tuesday with a Free Test & Tune session sponsored by FST Carbs. Tuesday will also host a special American Race Cars/Brando Custom Paint Race For The Dragster with a limited field of entries vying for a brand new race car. Wednesday, Thursday and Saturday are reserved for separate races paying $30,000-to-win each day with Friday reserved exclusively for the big one, the K&N Spring Fling Million. After hosting several years of successful events on the east coast, co-promoters Peter Biondo and Kyle Seipel brought their brand of big money bracket racing to the west in Las Vegas six years ago. While Las Vegas might be known as the City of Lights, there is only one light in the town racers are concerned with and that’s the one shining on The Strip’s guard wall signifying a win in their lane. Three years ago, Biondo and Seipel instituted the Spring Fling Million which has brought much of the best racers from three separate countries out west. First year’s winner Verdi hails from Virginia, with Bogacki making his home in Illinois and Reid from Texas. While the payout for each of the week’s races is guaranteed, the actual winner’s share of the Million is guaranteed to be at least $250,000 regardless of car count. As the car count increases, so does the winner’s share with the potential of 475 cars paying an actual $1,000,000. In addition to the purse money, each Spring Fling event is highlighted by over $60,000 in product giveaways from a host of manufacturers. On Friday morning all Spring Fling entrants will be given a single time trial in the Brodix Run For The $50,000 with the best package walking away with a set of Brodix SR20 heads. On top of this, if a driver puts down a perfect run; a combination of a .000 reaction time along with a dead-on the dial elapsed time; that driver will get paid $50,000 on the spot. If a perfect run is not made during the Brodix Run For The $50,000 session, $20,000 will be automatically awarded to the first perfect run made during any round of Friday’s Spring Fling Million main event. DragChamp is your source for Spring Fling Las Vegas drag race results. For more big money bracket racing results, click here. Adam Davis Wins $25K Thursday At The Million!